This snapshot from NASA's Solar Dynamics Observatory shows a stunning prominence associated with a Sept. 8, 2010 solar flare. 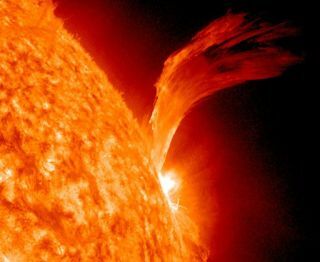 NASA hasdevised a new tool in the battle against massive eruptions from the sun: anearly warning system to protect electrical grids on Earth from extremelypowerful solar storms. The newproject, called Solar Shield, is designed to predict the severity of powerfulsun storms at specific locations on Earth to help power companies planresponses and limit the potential damage to their equipment. "Itamounts to knowing 'something is coming and it may be big,'" said projectleader Antti Pulkkinen, a research associate at NASA's Goddard Space FlightCenter in Greenbelt, Md., told SPACE.com. But Solar Shield should provide "much morespecificity." The chieftarget for NASA's Solar Shield are huge sun eruptions called coronalmass ejections, or CMEs, which can shoot off billions of tons of ?plasmaand charged particles. The sun iscurrently going through a more active phase of its 11-year solarweather cycle. It has been emerging from a prolonged lull in activity andis expected to hit the peak of the current cycle in 2013. When themagnetic field associated with a CME encounters the Earth?s magnetic field, thetwo merge and an enormous amount of energy is transferred to thegeomagnetosphere. This resulting current can affect astronauts or satellites inspace, as well as commercial power grids. If the CMEis strong enough, the grids can becomeoverburdened or damaged. The resulting blackout could last anywhere fromhours to months, depending on the amount of damage sustained. Strong CMEsare classified as low-frequency/high-impact events, meaning that while they arerare, their consequences are far-reaching, researchers said. A 2008workshop by the National Research Council?s Space Studies Board predicted thata "severe geomagnetic storm scenario" would have societal andeconomic costs of up to $2 trillion in the first year alone, and recovery timeranging from four to 10 years. Thepredictions from NASA's Solar Shield could potentially help avoid the worst ofthe damage, researchers said. Differentpower nodes are affected by the resulting magnetic storms in different ways.Part of this depends on the time of day; systems are more vulnerable during non-peakusage hours. Locationalso factors in. High latitude locations experience more dramatic impacts thantheir low latitude counterparts. Another factor is local geology; the resultingcurrents are affected by the ground conductivity. So each nodefaces a different level of risk, which Solar Shield aims to calculate. But howdo they do it? It goessomething like this: Once a coronal mass ejection is registered, data from the sun-watchingobservatories like the SOHO spacecraft and NASA's twin Stereo satellites allowthe team to create a 3-D model and provide a relatively long-term prediction asto its arrival time, ranging anywhere from 24 to 48 hours. While the CMEtravels through space, the team uses the computers at Goddard's CommunityCoordinated Modeling Center (CCMC) to create generalized predictions. As thestream of particles moves closer to Earth, it passes NASA's AdvancedComposition Explorer ? a space weather monitoring satellite ? about 30 to 60minutes before reaching our planet. The ACEsatellite collects real-time data, enabling the team to quickly refine andnarrow their predictions. NASA then notifies the Electric Power ResearchInstitute?s Sunburst program with their results. "Wequickly feed the data into CCMC computers," Pulkkinen explained in astatement. "Our models predict fields and currents in Earth's upperatmosphere and propagate these currents down to the ground." Pulkkinensaid the Solar Shield project is still in the experimental stage and more data? meaning more solar activity observations ? will be needed to refine it. But hehopes that more individual power companies will be able to turn to the EPRI toreceive both forecasts and real-time information for the approaching storm. Each node couldthen take the action it deems appropriate, based on localized predictions, NASA,he added. ? These actionscould include simple things such as canceling planned maintenance work orhaving more employees on hand to deal with resulting surges, or strongertactics like disconnecting the most vulnerable transformers from the griditself. Such a controlled power outage only would be temporary, and far lessdamaging than an externally induced blackout. However, afalse alarm could be costly to the electric companies, so more real-lifeobservations and partners among the power industry are need to refine theprocesses, Pulkkinen said. "We'dlike more power companies to join our research effort," he added. "The more data we can collect from the field, the faster we can test andimprove Solar Shield."